To enable leading businesses across regions to come together to assess their common dependencies on a high quality natural environment, and to consider how to secure finance for this ‘natural capital’. Within the context of a Government drive towards ‘Clean Growth’, Local Industrial Strategies are being formed across England. These Strategies are expected to highlight the need to create the conditions for sustainable economic growth. The dependence of some businesses on the natural environment is well-recognised. Water utilities are prime examples. Other businesses depend on the environment in ways that are critical to their future success, even if they are more indirect. This includes, for example, the need for manufacturing and retail businesses to be resilient to local flood events. A productive, multi-functional environment is a core part of place-making, ensuring that localities can attract investment and employees. Businesses such as Ford Motor Company in South Wales, already recognise access to natural outdoor spaces as a cost-effective way of ensuring a healthy workforce. The ‘Environment for Success’ seminars are intended to provide a starting point for businesses to work together in order to secure the environment they need for long-term competitiveness. This will ensure that greater value is obtained from the resources that individual businesses already put into ‘greening’ projects. It will help groups of businesses to secure strategic investment in the ‘natural capital’ upon which they depend. 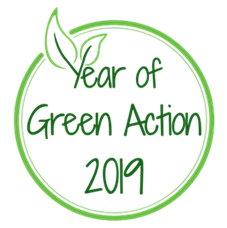 Participation will provide an opportunity to make a distinctive and long-lasting contribution to the 2019 Year of Green Action. The proposed ‘Environment for Success’ seminars will use a format of one or two hours of presentations and round-table discussion, centred around how businesses can secure a natural environment that meets their long-term needs. We will involve experts in this field. There will then be time for networking and discussion about follow-up within business-focused groups such as Local Enterprise Partnerships and Business Improvement Districts. The first regional seminar will run in early summer, with at least one more in the pipeline for 2019. We are currently actively engaging with stakeholders in South East England and the East of England and hope to announce the location and date of the first seminar soon.